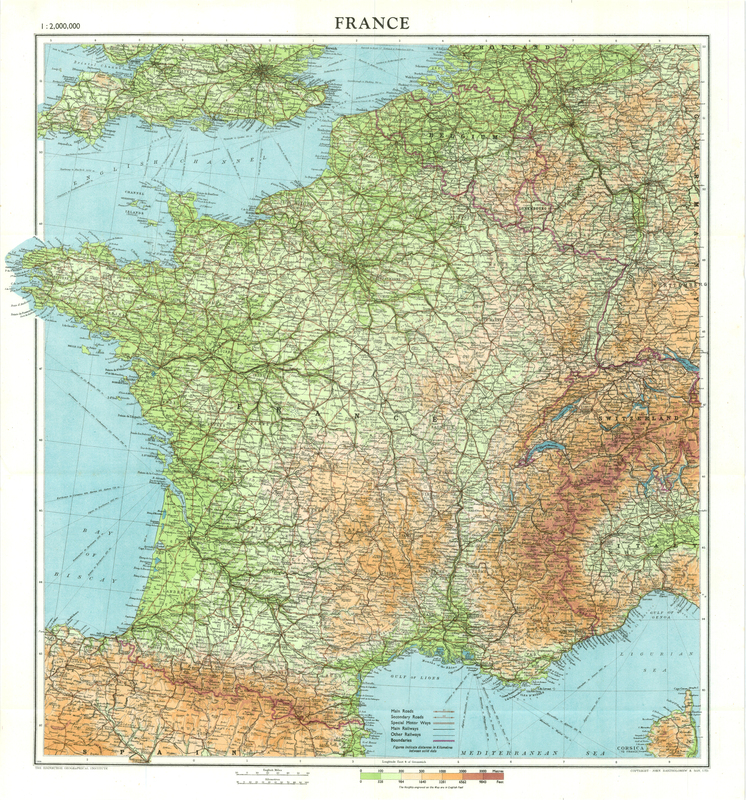 My thanks to Collins Bartholomew Ltd. for permission to reproduce their copyrighted 1942 map of France. It was originally published by John Bartholomew & Son Ltd Edinburgh, probably on or before June 1942. It was found in a pocket on the inside back cover of the book, France, published by Naval Intelligence Division, Geographical Handbook Series, Vol. 1, 1942. To view the map in greater detail, click on it once, then, if necessary, click on it a second time. Either click will provide a highly detailed view. Using your mouse, you should be able to scroll up and down and drag the map from side to side. This a fantastic representation. Does anyone sell copies of it? Probably not, but you might be able to find one in the pocket inside the back cover of a used copy of the book, France, Vol. 1, Physical Geography, June 1942, Geographical Handbook Series, Naval Intelligence Division (UK), part of a four-volume set. If you find that volume at a used book store, make sure the map is in the book before buying it. http://www.abebooks.com has some copies of the book as of this date (10/18/14). This is a GREAT website ! Thank you so much for this 1942 map of France. I’ve been searching for this a long time. Is it possible that there is a city & town directory with grid info etc. on the back the map? I would like to trace his route on the map but am having trouble locating the towns etc. Unfortunately there is no directory of cities or towns on the back of the map or elsewhere in the book. You might want to check out the following page on this website, https://wwii-netherlands-escape-lines.com/links-to-other-escape-and-evasion-websites/world-war-ii-military-maps/, where there are links to a variety of sources of military maps. Also, take a look at Franck Signorile’s research relating airmen and helpers to towns in France at https://wwii-netherlands-escape-lines.com/helpers-of-allied-airmen/french-helper-list/french-helpers-by-geographical-location/.